You can buy one of these fantastic mugs from MugWow – click on the image for details. 99.99%, by weight, of all the pesticides we consume are naturally-occurring. That’s a pretty amazing statement, isn’t it? It comes from a paper about dietary pesticides that was published in 1990, and referred to the American diet, but it’s almost certainly still not far from the truth – pesticide use, despite what some of the crazier corners of the internet will tell you – hasn’t increased significantly in the last 26 years. The authors of the paper concluded that “the comparative hazards of synthetic pesticide residues are insignificant” and it’s a valid point. Many of these natural pesticides – chemicals which plants use to defend themselves – have never been fully tested, and some of them are actually well-known toxins. Plants have been on this planet for a very long time, 700 million years give or take, which means they’ve had an awful lot of time to evolve defences. Some of these are physical, like thorns or spines, but chemistry plays a key role. For example, one of the most common toxins is solanine. It turns up in potatoes which, as any good gardener will tell you, are part of the nightshade family. Yep, like deadly nightshade. But don’t panic, it’s mostly in the parts of the plant we don’t eat, namely the leaves and stems, with only very small amounts found in the skin and virtually none in the flesh. Unless, that is, your potatoes are exposed to light. Then the tubers start producing lots of extra solanine (and another alkaloid called chaconine), as a defence to stop the uncovered tuber from being eaten. At the same time, they produce extra chlorophyll, which causes them to turn green. The chlorophyll is harmless, but the solanine most definitely is not. It causes vomiting and diarrhoea, and can even be fatal – although this is really only a risk for people who are undernourished. 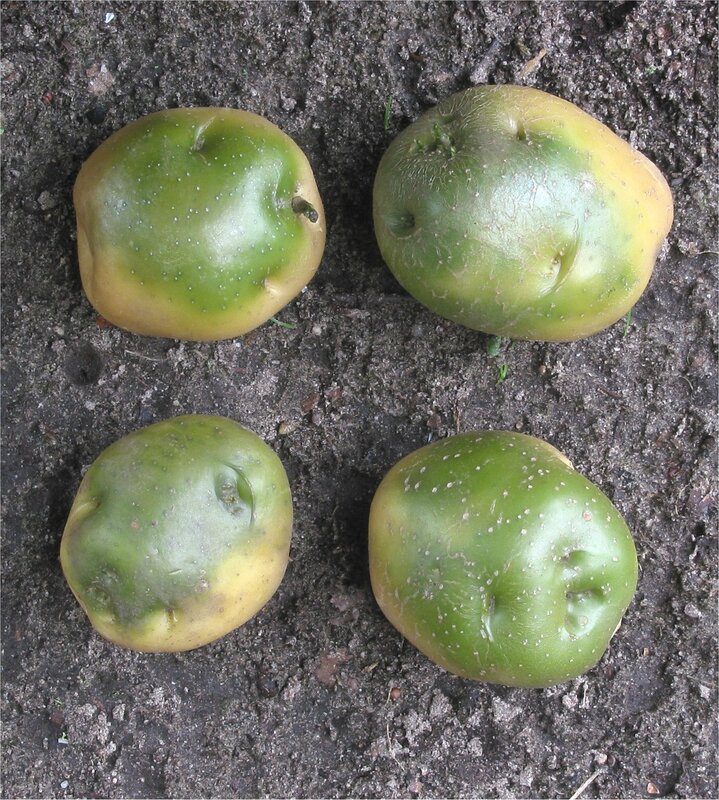 Still, if your potatoes have turned green its safest to throw them out, since cooking doesn’t break the toxins down. Even if they’re not green, if they have a bitter taste it’s safest to get rid of them if you don’t want to risk an extended visit to the porcelain throne. But solanine is just the tip of the lettuce. Capsaicin (the stuff in chillies) also evolved as a defence mechanism to repel and kill insects, and there’s evidence that it may be carcinogenic under some circumstances. 2,4-dihydroxy-7-methoxy-1,4-benzoxazin-3-one (DIMBOA) is another chemical which is found in corn, wheat, rye and other grasses and which has been shown to cause carcinogenic changes in human cell lines. Then there are all the various substances in herbs and spices, such as tetradecanoic acid in nutmeg, pulegone in peppermint, carvacrol in oregano and eugenol in cloves, nutmeg and basil. But not to panic. 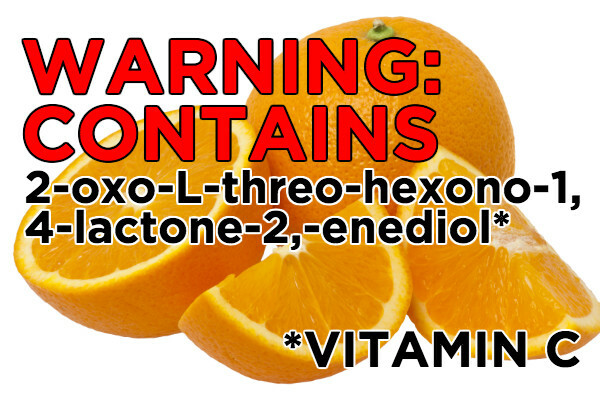 None of these chemicals are dangerous in the quantities that we usually consume them. And neither, while we’re here, are the really teeny, tiny amounts of synthetic pesticides that we might be exposed to. So just relax and eat your greens. Well, not if they’re potatoes. You know what I mean. Anyway, there’s one substance I haven’t mentioned yet, and it’s a biggie – it’s something most of us consume on a regular basis. In fact, it might be the source of over a gram of naturally-occurring pesticide a day, and few of us even give it a thought. What is it? Coffee. Yes, your daily dose of americano is a veritable cocktail of chemicals. As the dietary pesticides paper points out, “13 g of roasted coffee per person per day contains about 765 mg of chlorogenic acid, neochlorogenic acid, caffeic acid, and caffeine.” A single espresso shot uses about 8 grams of ground coffee, so a mere two shots will take you up to best part of a gram of chemically-goodness, and who restrains themselves to two shots a day? But there’s good news. Some of these substances could actually be beneficial. Chlorogenic acid appears to moderately lower blood pressure. Neochlorogenic acid might actually help to prevent certain cancers, as might caffeic acid (although results are mixed in this case). The world’s most widely-consumed psychoactive drug. And then, of course, there’s caffeine itself – the world’s most widely consumed psychoactive drug. It has umpteen (technical term) effects not the body, both positive and negative, the most famous being its ability to keep us alert and awake. It’s performance-enhancing and its use was at one point restricted for Olympic athletes, until 2004 when officials decided to remove those restrictions – presumably because they were proving impossible to enforce. But caffeine didn’t evolve for the convenience of humans, although we have, of course, played our part in farming and selectively-breeding plants. No, it originally evolved to paralyse and kill predator insects. Basically, to stop the plant being eaten which, from the plant’s point of view, is quite important. Interestingly, there’s evidence that it evolved separately in coffee, tea and cacao, suggesting it really is a pretty advantageous thing for a plant to make. But in case you’re wondering, it’s broken down by UV light, which explains why it’s not used as an insecticide spray on other plants. So, if you’re worrying about pesticides with a cup of coffee in your hand, you can stop. You’re probably consuming more pesticide, daily, than you will get from carrots in your lifetime. Drink up! 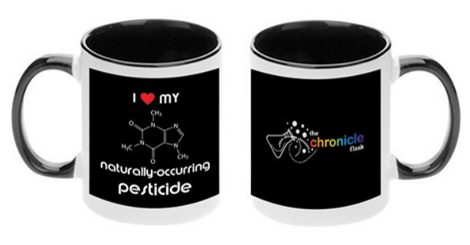 Do you love your naturally-occurring pesticide? The competition to win one of these mugs has now closed. For details of the winner, see this Facebook page. But if you were unlucky, never fear – you can buy one of your very own from MugWow. Use the code flask15 and you’ll even get a 15% discount – go on, you know you want to! You can also follow @chronicleflask on Twitter. Comments on this blog are welcomed. I love comments! But not if they’re nasty ones calling me a psychopathic pharma shill. Those will be deleted. All comments are moderated, so they won’t appear even for a second. Save yourself some time!